With a sprinkle of what researchers jokingly call “brick dust,” scientists restored health to a very sick mouse model of amyotrophic lateral sclerosis, extending its one- to two-week lifespan to almost two years. As reported in the January 27 Neurobiology of Disease online, the researchers treated the mice with CuATSM, a reddish copper chelator that can carry the metal into the brain and spinal cord. There, the theory goes, the chelator releases Cu ions to the Cu/Zn superoxide dismutase 1, an enzyme that causes a rare familial form of ALS when mutated and tends to aggregate when it’s missing its copper. While a mouse overexpressing both human mutant SOD1 and its copper chaperone CCS responded particularly well to the treatment, CuATSM also extended the life of a more standard ALS model carrying only the SOD1 transgene. The Australian company Collaborative Medicinal Therapeutics plans to start a Phase 1 safety study of CuATSM in people with ALS this year. Senior author Joseph Beckman of Oregon State University in Corvallis advises the company. “The biggest surprise is that these mice are borderline cured. I have never seen that,” commented Fernando Vieira of the ALS Therapy Development Institute (ALS TDI) in Cambridge, Massachusetts, who was not involved in the work. While the finding aroused excitement among people with ALS, Beckman cautioned that copper and impure preparations of CuATSM can be toxic. 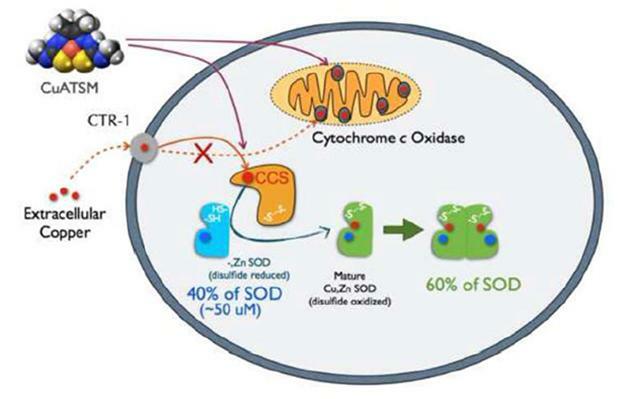 Beckman and colleagues believe the drug works by supplying copper not only to SOD1, but also to cytochrome oxidase c (COX), a respiratory enzyme that loses its copper to SOD1 in the mSOD1xCCS mice. Diacetylbis(4-methylthiosemicarbazone), or ATSM for short, chelated copper. Mutations in the SOD1 enzyme, which underlie about 2 percent of ALS cases, interfere with its ability to bind metals. Mature SOD1 dimers replete with both copper and zinc ions are highly stable, but evidence suggests the immature forms without their metal edge tend to misfold and aggregate (see Apr 2009 news; May 2009 news; Oct 2014 news). This fact led scientists to hypothesize that copper should fix the malformed enzyme. Researchers tried co-expressing the human gene for CCS in SOD1-transgenic mice, but that made the animals worse. They survived for just a few weeks, while mice with mutant SOD1 alone lived for months (Son et al., 2007). Some scientists think the extra CCS might have commandeered all available copper, passing it to the overexpressed SOD1 and leaving other Cu-dependent proteins, such as COX, high and dry. “I think it [CCS] is really throwing a wrench in the whole system,” said Giovanni Manfredi of Weill Cornell Medical College in New York, who did not contribute to the current paper. Beckman’s group was studying why those mSOD1xCCS mice fell so ill when researchers from the University of Melbourne who worked with CuATSM visited his lab. The scientists decided to try the compound in one double transgenic mouse, which was unable to stand and near the end of its short lifespan. The researchers dissolved CuATSM in dimethyl sulfoxide and dribbled in onto the pup’s neck, where it was quickly absorbed by the skin. A few hours later, the mouse was up and moving. Surprised, the researchers hypothesized that the added copper from CuATSM was enough to outfit both SOD1 and COX with the metal, allowing the mouse to survive (see figure above). The researchers repeated their success in several more mice, then started a blinded, randomized trial helmed by study first author Jared Williams. Williams and colleagues treated females with CuATSM the day after mating, so their embryos would get the copper and avoid developmental problems associated with the CCS expression. Once the pups were born, the scientists split them into three groups. Of 30 pups, 17 continued on the CuATSM treatment throughout their lives. These mice remained active beyond a year. By 600 days, most struggled to control their hind legs. They survived for 366 to 660 days. Regular lab mice typically live for 1.5-2 years, and mice with only SOD1-G93A transgenes live for about 133 days. For an additional six pups, the authors stopped the medication once they reached 21 days. The mice grew normally for another couple of months, but started to have trouble moving their hind legs around 70 to 90 days. They died between 122 and 132 days. Then, in seven more pups, the researchers stopped the treatment at 21 days, but restarted it at about 80 days when symptoms emerged. These mice recovered some movement control over the next two months, but eventually got worse and died between 302 and 377 days. Beckman and colleagues also tried CuATSM in more typical SOD1-G93A mice that do not have the CCS transgene. Starting treatment when animals were 50 days old extended life by about three weeks, to 155 days, confirming previous reports that the chelator could benefit SOD1 mice (McAllum et al., 2013; Roberts et al., 2014). “This could be a very nice drug for mutant SOD1 ALS patients,” commented Jeffrey Rothstein of Johns Hopkins University in Baltimore, who was not involved in the study. Other experts who spoke with Alzforum agreed. “I think that it’s very well worth exploring,” said Lucie Bruijn of the ALS Association. However, mutant SOD1 accounts for only a fraction of people with the disease. “I am not sure if it is going to have an impact on sporadic disease,” said Bruijn. Rothstein and Vieira doubted it would, but Beckman suspected it might because the normal protein has been observed to misfold in sporadic cases (see Oct 2010 news). Bruijn cautioned that the leap from mice to humans is a big one, especially since CuATSM worked best in mice that overexpressed both human mSOD1 and CCS, and only weakly in animals that overexpressed just mSOD1. Beckman and colleagues argued that the double transgenics better reflect the SOD1:CCS ratio in people than do mice that overexpress only mSOD1. Beckman said that if CuATSM proves safe and effective, he envisions it as a prophylactic that someone with a SOD1 mutation might take for decades. He acknowledged that researchers would need to know plenty more about the molecule before any use as a long-term treatment. Williams JR, Trias E, Beilby PR, Lopez NI, Labut EM, Bradford CS, Roberts BR, McAllum EJ, Crouch PJ, Rhoads TW, Pereira C, Son M, Elliott JL, Franco MC, Estévez AG, Barbeito L, Beckman JS. Copper delivery to the CNS by CuATSM effectively treats motor neuron disease in SOD(G93A) mice co-expressing the Copper-Chaperone-for-SOD. Neurobiol Dis. 2016 Jan 27;89:1-9. [PubMed].